Poland now looks set to become the latest shoe to drop in the ongoing crisis which is steadily extending its reach from one country top another, right across the whole of Central and Eastern Europe – the latest and possibly the last in the sense that if Poland does role belly side up this will probably be the one which finally does turn the apple cart well and truly over. Eastern Europe is – as Unicredit’s Eric Hempel argues in the extended quote above – quite simply falling headlong into a very severe credit crunch, as funding for bank lending steadily dries up. And, unfortunately, as the evidence mounts that Poland is caught in the teeth of this crunch, its real economy falls deeper and deeper into the dreaded pit with each passing day. FT Alphaville’s Izabella Kaminska has the forex loan story here (see also see here last Friday). Basically all I have to add are some charts (and some real economy analysis) to add a bit more weight to the point and illustrate more explicitly the speed with which things are now moving forward. How Important Are Forex Loans In Poland? Polandâ€™s exposure as to foreign-currency lending has already been extensively documented and analysed on this blog, but just in case there is still anyone out there who holds defiantly onto the view that the extent of such lending in Poland is simply too small and too recent to have any sort of severe impact on the economy, let’s take a look at the recent progress in such lending, at least as far as household behaviour goes. As can be seen in the first chart below, since the middle of 2007, the rate of growth in zloty loans has slumped steadily, while forex borrowing has gone up and up, until….. until last November, when the whole thing turned. It now pretty clear that something quite important happened to the Polish banking system back in October – as I attempted to analyse in this post which was written at the time. The extent of the transition can also be seen from the monthly chart for outstanding household loans, where again zloty loans can be seen to have have virtually stagnated, while forex ones went shooting up and up, till they seem to have hit a something akin to a “dead stop”. Nor does the loan “revaluation” argument help us here, since during the period under consideration the zloty has been falling (see chart below) and hence the book value of the capital stock of forex loans should rise, not fall. (I mean, unfortunately, and from a large number of comments I have received on my blogs over the last 18 months, I have to say that this is the part of the story that many of those who have taken out unhedged forex loans in Eastern Europe simply do not “get”, it isn’t so much the payment stream you need to look at (influenced by the relative interest rates in the two currencies being compared) but at what happens to the capital value – that is what happens to the outstanding sum you owe, as measured in your own local currency, or at least in the currency in which you are paid. And for those who are interested in how domestic monetary policy works these days (ie how effective central bank interest rate policy is at containing lending in a small or medium sized open economy with access to global finance) it should not come as a surprise to find in the chart below that the uptick in enthusiasm for forex loans really started to gain momentum after the Polish central bank started to raise interest rates, as the short term interest rate differential with Swiss Franc loans simply grew and grew under the impact of monetary tightening. 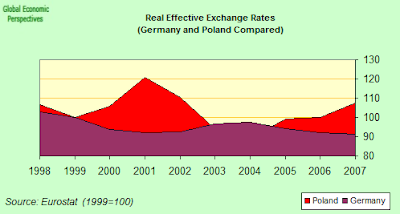 This application of standard monetary policy by the Polish central bank did have one result, however, and that was that the value of the zloty shot up (in particular here when compared with the euro, which is what really matters for exports), and with it the relative cost of Polish industrial products. And what did this lead to? Well, a steady deterioration in the trade deficit for one thing. And, of course, an ongoing contraction in industrial output for another. Poland’s industrial output continued to fall in December, with statistics office data showing today (Tuesday) that output fell 4.4 percent year-on-year, after dropping 9.2 percent in November. In month-on-month terms, industrial output also fell 3.7 percent, (following a whopping 15.4% drop in November over October) while seasonally adjusted output fell 7.4 percent year-on-year, showing business conditions are quickly deteriorating. Wage and employment data for December on Monday also suggested companies, in response to falling demand for their products, were starting to lay people off. The pace of wage growth in December was the lowest since 2006.
Business confidence in Poland’s industrial sector fell in December to its lowest level since surveys began in June 1998 as plummeting new orders depressed output and employment, according to the latest 300 industrial company survey prepared by Markit Economics for ABN AMRO. 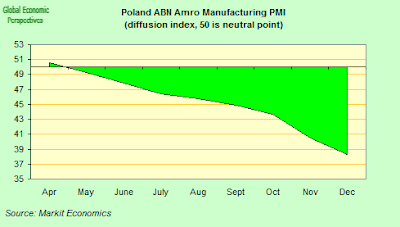 The survey also found that the Polish manufacturing purchasing managers index dropped for the seventh consecutive month – to 38.8 from 40.5 in November. The new business indicators dropped at the fastest rate in survey history, and the new orders index fell to 32.2 in December from 35.6 in November, with new export orders decreasing to 31.4 from 40.1. So we can obviously expect the January result to be even worse. 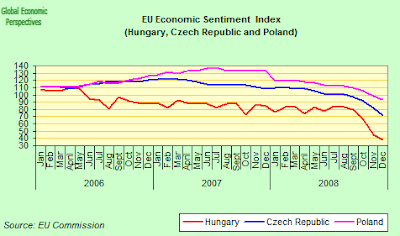 Previously, as can be see in this chart for the EU Economic Sentiment index, Poland had been faring rather better than some of its Central European neighbours (like Hungary and the Czech Republic). But the downward movement is now evident and pronounced. This slowdown in industrial output has also been accompanied by a levelling off in construction activity, which has been trending down in year on year terms since the late summer, but which even fell back month on month in November (by 1% over October) for the first time in many months. In fact if we look at the actual index, rather than the year on year growth numbers, we will see that activity levels have been pretty stagnant for six months or so now. After the sub-prime crisis banks became more restrictive in their lending policies. It is hard for real estate companies to get loans for their projects. Developers have to delay significant part of their pipeline projects, in most cases till an unspecified date in the future. The significantly tightened lending policies for households will worsen already weak demand for housing. Additionally, the already anemic investment activity should deteriorate further. It should be more and more difficult for real estate developers to sell their projects in the market and this source of money is also drying up. Retail sales levels have also flattened out recently, although they have continued to rise slightly in recent months. November 2008 retail sales grewth by just 2.7% year on year confirmed a fast slowdown in domestic consumption following 7.9% growth in October and 11.6% growth in September. 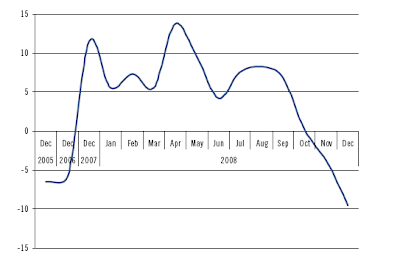 While the Penkon consumer confidence indicator is now showing its lowest readings since 2005. It is most likely that the good times for the retail industry are over. The drivers that fuelled sales and margins of Polish retail companies â€“ rising consumer vdemand and strong Zloty, have disappeared and we do not expect them to return within foreseeable future. The core of the East Europe problem is that savings in many parts of the region are not sufficient to underpin growing loan books, thus the banks in the region – which are largely foreign owned – have needed to draw on their parent companies to bolster their balance sheets. When many of the parent banks entered into their own refinancing problems last year as the global financial crisis spiralled out of control, this channel of funding was transformed from being a source of strength into being a source of weakness. In addition, at the start of last summer the Polish currency soared to record highs against the euro, and many Polish companies took out hedging contracts, effectively betting on further zloty appreciation. Now, as the currency has weakened and weakened, many of these very same companies have found themselves with substantial losses. The Polish financial watchdog estimated last month that local banks may need to take out as much as $284 million in provisions to cover for client losses on currency options, which currently amount to 155 million zlotys ($49.33 million) among Warsaw-listed companies. And that figure could obviously grow if the zloty continues to weaken. The zloty is currently at its lowest level since the end of 2004 – around 4.306 to the euro. Furthermore, it seems the governmentâ€™s promise of accelerating the process of euro-adoption – which helped calm the zlotyâ€™s decline back in October – is failing to reassure markets. In fact most analysts seem to think that at this point having a 2012 entry target is as good ashaving no target at all. On top of all this, there is no guarantee that Poland will meet the five Maastricht convergence criteria. Holding the PLN stable within the ERM2 bands for two years may prove to be a tall order while the budget deficit, which has been squeezed lower purely as a result of recent strong economic growth, will widen sharply as the economy slows, breeching (SIC) the 3%/GDP limit and disqualifying Poland from Euro entry. As Izabella says there is a sort of catch-22 at work here: the only way Polish zloty can be saved from further weakening is Eurozone membership, but Eurozone membership becomes ever more distant as the zloty weakens due to the Maastricht criteria. Yet if we look at what has been happening to competitiveness in Poland in recent years (see REER comparison chart with Germany below), it is clear that due to the combined effect of wage inflation and a rising currency, there is some correction still to be made (not comparable with the Baltics or Hungary, but still) if Poland is recover its lost export prowess. And here’s another chart from Citi Poland showing how unit labour costs have steadily risen, and productivity has steadily fallen. The critical crossover point seems to have been somewhere towards the start of 2007. This pattern has been repeated in one CEE country after another, and really lies at the heart of the current economic crisis in the region. In an attempt to boost liquidity in short-term Swiss franc money markets the National Bank of Poland has set up a currency swap agreement with its Swiss counterpart and the European Central Bank. The agreement will now last until at least the end of April. But while this agreement is obviously providing some relief it is clearly far from solving the problem. â€œToday, the SNB, the ECB and the NBP are jointly announcing that they will continue these one-week euro/Swiss franc foreign-exchange swap operations at least until the end of April to support further improvements in the short-term Swiss france money markets,â€ according to the Polish central bank statement earlier this week. At the heart of the forex lending (and exposure) in the East lie a small number of major banks whose head offices are to be found in large cities in the core countries of the EU (Western) old guard. Among these, indeed in pride of place here, comes Italy’s Unicredit . (See my longer post on Unicredit here). Now it is true to say that Unicredit’s Polish subsidiary – Bank Pekao – is relatively immune to the forex lending problem, since it refused to offer mortgages in foreign currencies, and its loan-to-deposit ratio at about 90 percent (compared with an average of about 110 percent for Polish banks generally) is fairly healthy. 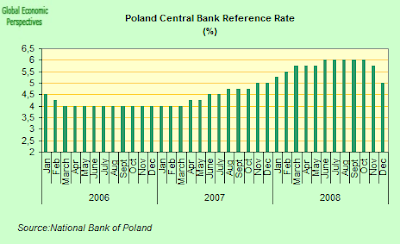 These features and a capital adequacy ratio of around 11 percent should offer Pekao a reasonable buffer going into the slowdown, but this is not the same thing as an absence of risk, since any serious deterioration in operating conditions inside Poland will affect PLN loan default rates as well as Fx ones, although evidently the banks with fx loan exposure are much worse positioned. Concern about the position of the entire Unicredit group has been mounting steadily of late, as witness be the latest research report from Moodyâ€™s Market Implied Ratings group, which highlighting nagging doubts many observers have over the degree of the bankâ€™s exposure to Central and Eastern Europe. The note, written by analyst Lisa Hintz, suggests UniCreditâ€™s CDS-implied rating of A1 may well be â€œan overly optimistic signal of the bankâ€™s level of credit riskâ€. UniCredit largely avoided the proprietary trading and structured product problems suffered by the other large European banks. However, the financial problems arising from the economic downturn, such as imbalances, could cause deterioration in UniCreditâ€™s loan portfolio, and we do not believe this is reflected in the trading levels of its credit default swaps. UniCreditâ€™s CDS-implied rating is A1, down three notches from a recent high of Aa1 and one notch below its senior unsecured rating of Aa3. We still see this as an overly optimistic signal of the bankâ€™s level of credit risk, in that it doesnâ€™t capture UniCreditâ€™s comparatively thin level of capitalization and heavy exposure to Central and Eastern Europe. This exposure came after a rapid expansion which has left the bank with an unseasoned loan portfolio. 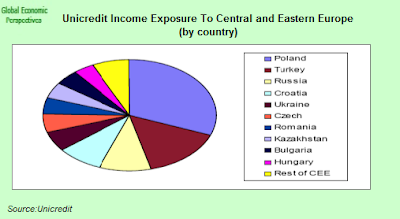 Loans to Central and Eastern European clients made up 13% of UniCreditâ€™s assets at the end of 2007. These made up an even greater portion of its revenueâ€”21% in the third quarter, and at the top of the list in both cases – see charts below – comes Poland. Fortunately no one is suggesting that the level of loan defaults might be anything like the 60% anticipated in Ukraine (or Russia? ?, both of which fortunately make up a much smaller part of their portfolio). 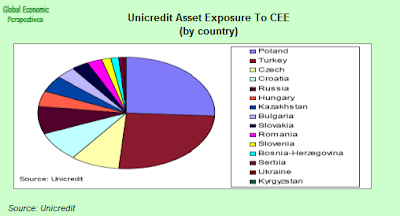 This CEE activity means UniCredit leads its rivals Austria’s Erste Group Bank and Raiffeisen International, France’s Societe Generale, Belgium’s KBC and Hungary’s OTP in terms of both emerging European assets and exposure. Indeed, UniCredit fell again in Milan today, after the Italian central bank warned yesterday that bank lending is declining and interbank liquidity is insufficient. UniCredit dropped as much 6.5 percent to 1.26 euros, the lowest intraday price since May 13, 1997, and traded at 1.29 euros as of 9:55 a.m. local time. UniCredit shares have now fallen 77 percent since January 2008. The Bank of Italy said yesterday there has been a â€œsignificant deteriorationâ€ in the general economic scenario and that â€œlending growth continues to decelerateâ€ because of the high cost of funding for banks. â€œThe situation just seems to keep spiraling in a negative way and if confidence in and among banks doesnâ€™t return thereâ€™s no easy way out,â€ said Giulio Baresani Varini, head of investments at Banca MB SpA in Milan. Meanwhile UniCredit Bank Austria AG, Austriaâ€™s biggest bank, plans to decide whether it will ask for Austrian state aid as part of the national bank bailout programme by the end of March. â€œWe plan to make a decision by the end of the first quarter,â€ Chief Executive Officer Erich Hampel told journalists in Vienna today. Hampel said in December that Unicredit Bank Austria would need â€œabout 2 billion eurosâ€ to increase its Tier 1 ratio, a measure of financial strength, to 9 percent from 7.6 percent at the end of Sept. 30. But of course it isn’t only Unicredit and its subsidiaries who are affected. BRE Bank SA fell to a three-month low on the Warsaw stock exchange this morning, leading Polish banks lower, as loan provisions and losses on derivatives cut into fourth-quarter earnings. The bank – which is a subsidiary of Commerzbank AG – slumped as much as 16.3 zloty, or 10 percent, to hit 146.9 zloty before recovering to 147 zloty at 10:32 a.m. in Warsaw, the lowest level since Oct. 27. The benchmark WIG20 Index was down 3.2 percent and has fallen 8 percent so far this year. The index slumped 48 percent last year, posting its biggest annual decline since its creation in 1994. Despite 2008 being the worst year in a relatively short history of Polish equity market, with WIG20 down 48% we are not looking for a turnaround in 2009. The performance of the Polish market should still be strongly influenced by global markets which are likely to take some time to recover given the scale of a global macro slowdown not seen since 1945. The illness appears to be very serious and you simply need time to properly recover. We expect the WIG20 index to be down this year by some -10% to -15% (driven largely by expected weak performance of the banking sector). 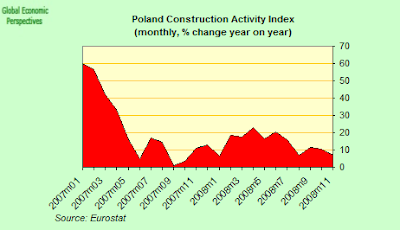 So Just What Are The Chances Of A Polish GDP Contraction In 2009? Well the chances of a contraction of some order in Poland in 2009 are non negligible in my opinion. We are evidently not talking here of something of the order of the Baltics, Romania and Ukraine, or even of the order of Hungary, but still the extent of the slowdown in Poland (or the Czech Republic) should not be underestimated. Average corporate wages rose at their slowest pace in since November 2006 last month, suggesting economic growth is slowing more sharply in the wake of the global financial crisis than many seem to think. The latest central bank forecast suggested that Polandâ€™s economic growth will slow to 3.7 percent this year from about 5 percent in 2008, but this is very optimistic, and far from everyone agrees. Citi Poland come in with a much lower forecast, and in my opinion a much more reasonable one. The Polish economy is not immune from global disruptions and an incoming and unavoidable slowdown is already visible. The question is when we will see the recovery. The answer is not easy as so far we have not yet seen the weak GDP numbers which are just around the corner. Looking back at the most recent slowdown during 2000-2003 period we observed 10 consecutive quarters GDP numbers below 2.5% and within that 5 sequential quarters when GDP growth came below 1%. However, this time the most recent 3Q08 GDP number came in at 4.8% so we see a lot of bad macro news ahead of us. In 2009 we expect GDP growth slowing to 1.4%, driven predominately by deterioration in investment growth as banks started to be very restrictive in lending while corporates are looking for savings and are rather rapidly scaling down investment programs. I would go somewhat further. I think it is perfectly possible to see a recession in Poland at some point in 2009, not necessarily a strong one, but a recession just the same.